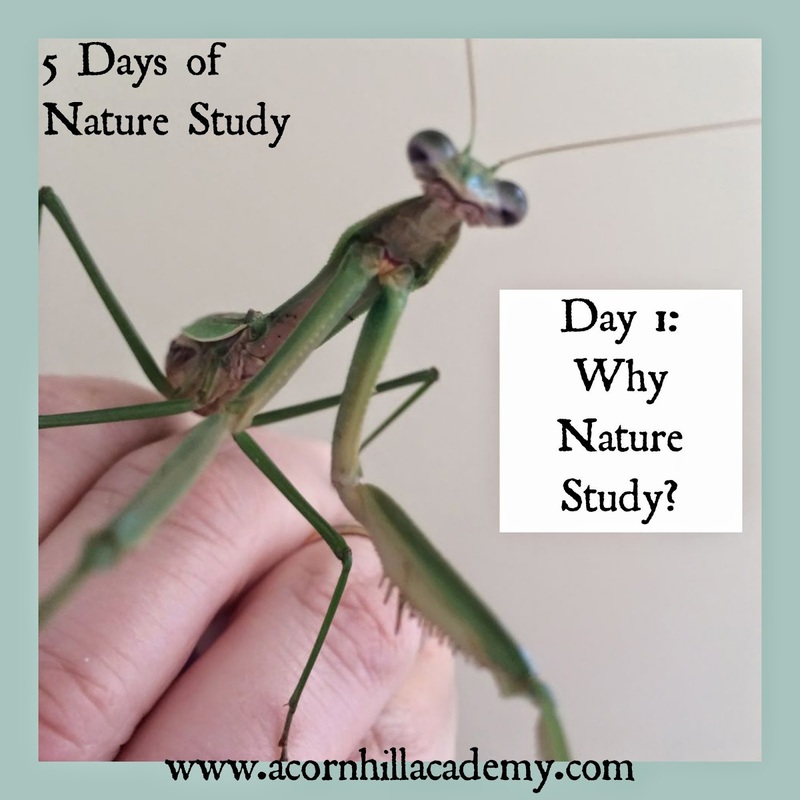 Acorn Hill Academy: Why Do Nature Study? 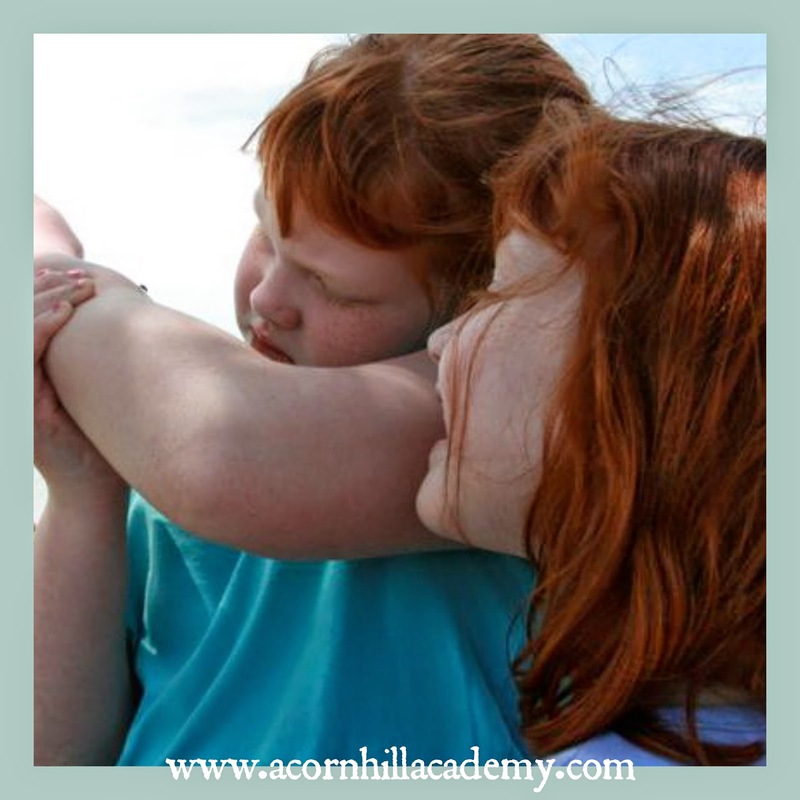 This week I'm participating in a 5 Days Blog Hop, sponsored by the Schoolhouse Crew. I hope you'll join me for 5 Days of Nature Study! Have you ever wondered why nature study is so important? Have you wondered if it even is important, given all the other things that seem so much more pressing in a child's education? Do you see what she's saying? 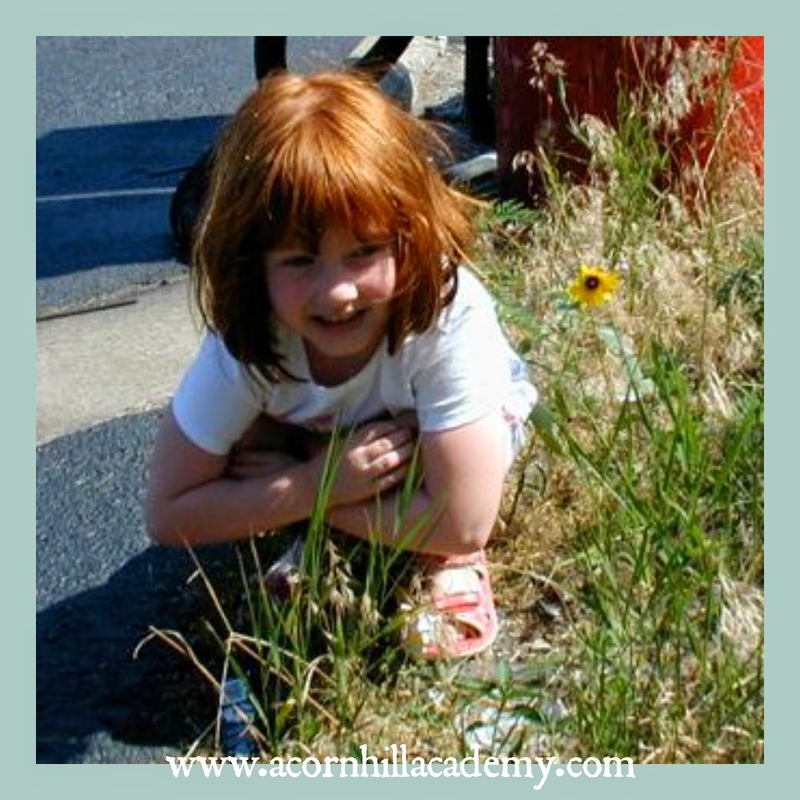 Nature study gives any child skills that will take them anywhere they want to go in life. Think about it: children learn the critical habit of attention, the indispensable virtues of patience and perseverance. I love nature study. Love it. If I had my way, I would spend all my time outside, looking for interesting things, identifying them, and attempting to draw them. (Miss Mason introduced me to the idea of a nature journal - more on that later this week.) As a child, I lived in the country with a swamp in my back yard. We found all kinds of things - wildflowers, puffball fungi, salamanders, frogs, toads, snakes, you name it. My dad even brought home a baby skunk for us to see one time! We weren't directed to learn about nature, but it came naturally to us, and my dad was always willing to answer any questions we had. 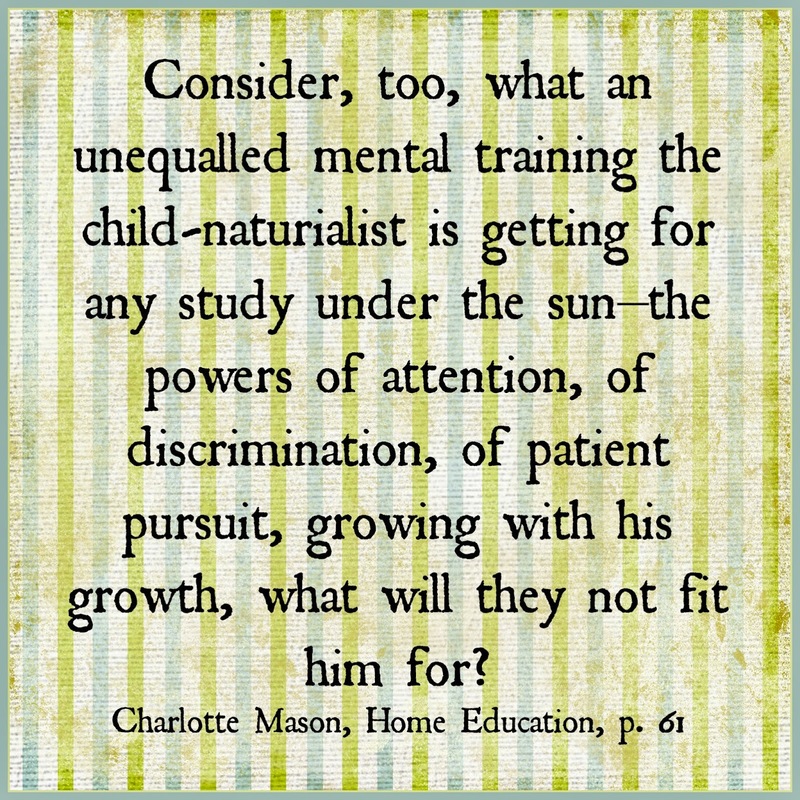 When my children came along and I began to teach them, and started learning about Charlotte Mason's principles, suddenly I felt intimidated at the idea of nature study. What if I messed it up somehow? teacher, as I tend to do. As Miss Mason says, "The Mother must refrain from too much talk" (vol. 1, p. 78). That's a constant challenge for me, actually. The idea is to let the child form a relationship with nature, not listen to me lecturing about it. I love to share my connections with my children. I am every bit as excited as they are when we go outside and find things. I'm learning, though, to write in my own nature journal and let them have their own experiences, uninterrupted by my chattering. not inside making a mess. They're not staring at a screen. They're in the fresh air and sunshine, getting some exercise. Those are all very good things. So, what are you waiting for? Go outside today with your children and see what you can find that is new to you! I love our rural home where we've been able to see deer, racoons, groundhogs, possums, skinks, snakes, turtles, foxes, and turkeys in our backyard. We studied the skunk through the window. We love our nature study time, too. Looking forward to reading the rest of the series. Love your site! Found you on FB - really look forward to reading more of your posts! Nice post :) Thanks for sharing! !